Air Dogs is a fighter plane iPhone game for both the iPhone and iPad from Createplayshare featuring nonstop combat action with support for multiple players going head to head on the same device. Using tiny little airplanes that move across the board continuously you have to fire and collect weapons and life capsuls and survive longer than the other players/team to win. The gameplay style is very similar to the classic Asteroids game where you go out on the top end of the board and come in from the bottom in non-stop moving fashion. A controller on the bottom allows for moving left/right and doing turns, and tapping it shoots your active weapon. Movements are natural enough to grasp although it will take some time be figure out the steering which is a bit slow. The placement of the controller is good in that it does not cover any of the action. You can’t really do much in terms of switching your active weapons. If you pick up a rocket, you’ll shoot a rocket, otherwise you fire bullets from your fighter plane. There is a life bar on your plane at all times and when it fully depletes you’re dead. There are a dozen different objects in the game from bullets to speed boosts, shields, bombs, and missiles of various colors and strengths. You can play vs. the bot or vs other players, not online however. You can play single quick games or in arcade mode if you don’t have anyone around to team up with. Since Air Dogs is a universal binary, on the iPad the team mode makes a lot of sense with the larger area for multiple hands although you can probably do a 2 person war on the iPhone as well. Team Wars can have a maximum of 2 teams, with a maximum of 4 humans and 4 bots total. So you can for example have 2 humans on each team and 2 additional bot on each team. Friendly fire mode keeps you safe from getting hit by your own shots, which can be disabled. Similarly the Airplane Collision mode can be turned off in which case you can actually cause damage if you don’t avoid hitting other planes. 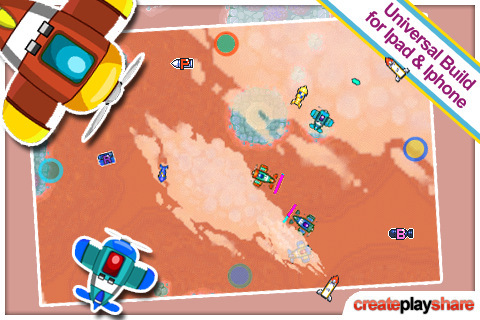 Graphics are sharp and the background music creates a fun yet chaotic type atmosphere. 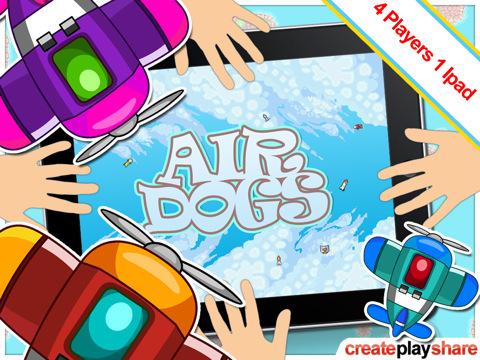 Air Dogs is a great little nonstop shooter which is a ton of fun on the iPad in team war mode. On the iPhone it makes for fun quick survival action vs. the bots. AppSafari review of Air Dogs was written by Joe Seifi on December 29th, 2010 and categorized under App Store, Fighter, Games, iPad apps, Multiplayer, Universal. Page viewed 5597 times, 1 so far today. Need help on using these apps? Please read the Help Page. Hey this review was really helpful. I downloaded the game. Its a great multiplayer game and a great great game idea.